At times, even our feline friends grow sad or depressed. Just like humans, they have emotions and are impacted by their environment. It sounds like your cat is probably grieving for the other cat. I have owned a couple of cats with this inside/outside problem over the years. When I was a young girl, one cat would sit under my bedroom window and yowl until I let him inside. If he did not meow when you owned the other cat, then another cat might help. However, you should also consider the stress that adding a new cat to the household will bring. Many cats have a hard time adjusting to a new animal in the household. There are specific steps you should take when introducing a new animal. If you choose to go that route, please come back here and let us know, so we can offer some additional advice. These are just a few of the dangers out there. I really do urge you to consider keeping him inside and not allowing him outside as a possible solution to your problem. 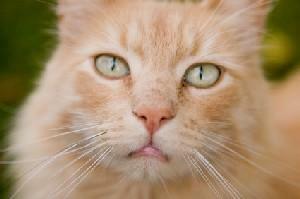 He may drive you crazy for a while, meowing to go out, but ultimately he will live a safer and potentially longer life. A couple of questions, and thank you so much for being an available resource: Does a cat ever get over the loss of an owner? I had to (HAD TO) give up my little stray of three to four months to someone else...who promised to take her in. Then, when I went back to check on her six to seven weeks later, they had farmed her out somewhere. Will she always be haunted by the loss of me (we were close) or do cats get over it? Why did my kitty not want to be touched in any way, even a brief rub on the head, after she had her kittens, but she was a real love bug beforehand? This has been gnawing at me for a while. ~~Mary B.
I understand your concern over this cat. Cats do seem to experience emotions just like people and it is likely that she misses you just as much as you miss her. However, if her new home is loving and kind and takes good care of her, she will adjust with time and will be happy. No one is sure how long a cat's memory is. I had one cat as a young adult who loved living at my parent's house. We lived there about two years when I got married and moved out. It was about six years later that I took her back home while we moved to a new location for a visit to "Grandma". She was so excited to see the house and went directly into her old routines. I really don't think she appreciated it when I made her leave again. I've had other cats that I gave away that seemed to not even recognize me weeks later. It may have to do with the cat's temperament too. As for acting strange after having kittens, there are several reasons. Cats have hormones just as we do so she may have just been dealing with hormones and feeling grumpy. Most cats want to be left alone when they don't feel well. Or, she may have been protective of her kittens and not wanting anyone to bother her or them. More than likely, once the kittens were older, she would have returned to her normal loving self. I hope this helps. It sounds like your cat enjoys the company of other cats. However, a move can be extremely stressful on our feline friends. Adding another cat to the household might not be the best thing right now. A new cat might be more aggressive and attack him, for example, which would cause more stress. It might be better to wait for a bit before adding another pet to the household. Give him a lot of extra attention until you feel he has adjusted completely to the move and then come back and visit us to read about the steps to use when adding a new cat to your home. This will lessen the change of stress and help both cats adjust to the new situation. Good luck!